African art got even better in the Middle Ages, after about 400 AD. By this time, nearly all of the people of Africa were trading and getting richer, and making more complicated pieces of art to show off their new wealth. They were also interacting with people from all over Asia and Europe, and with each other, and experimenting with mixing different artistic traditions. 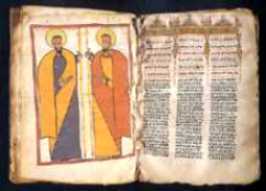 In Kush and Aksum (modern Sudan, Ethiopia, and Eretria), many people converted to Christianity about 300 AD. But even though they were Christians, like the Romans, these people also traded a lot with India. Their images are a mixture of their own ideas with Roman, Indian, and Islamic art. 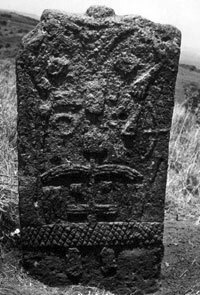 At the same time, East African people who remained traditional believers were carving stone stelae as grave markers in a much more African style. Even though they were only a little further south, they were more independent. So they used their art to show off their independence from foreign influences. Very few traders had reached South Africa in the Middle Ages. In Zambia, people painted rock art onto the walls of caves as they had already been doing for thousands of years. 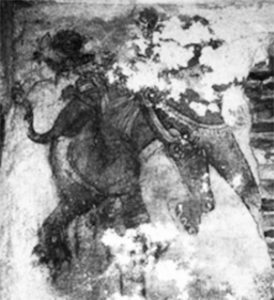 This painting, probably done by Twa women about 500 AD, would have been used in coming of age ceremonies for girls. Even further south, the San people painted rock art onto the walls of caves. They painted hunting scenes and religious ceremonies. Copper sculpture from West Africa (Tada, Nigeria ca. 1300 AD). In Central Africa, people formed the Luba Empire about 1300-1400 AD. They also developed their own artistic styles. And further north in West Africa, people got richer with more and more Islamic trade across the Sahara desert, as the people of West Africa bought salt with their gold and slaves. Rich West African people patronized artists who molded increasingly realistic bronze and brass sculptures. 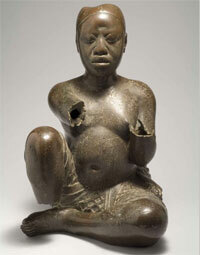 Did you find out what you wanted to know about medieval African art? Let us know in the comments! Or check out this article on African artin the Encyclopedia Britannica (unfortunately there’s not much on early African art though). Cite this page: Carr, K.E. Medieval African Art. Quatr.us Study Guides, May 19, 2017. Web. April 20, 2019. I’m sorry, I don’t know where there is any higher-resolution version of this particular image. A Google search didn’t turn anything up. Thanks so much! This article had lots of information. Maybe try to include more dates and times? I was using this article for school and it didn’t help at all. Thanks for a waste of time. I’m sorry you were disappointed! What were you trying to find out? I’d be happy to answer your question.